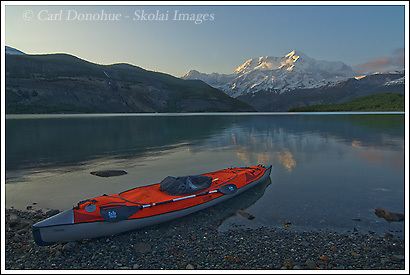 Sea kayak, Taan Fjord, Icy Bay, Wrangell St. Elias National Park, Alaska. So here’s the beginning of where this trip gets fun. This is one of the last photos I took this particular evening. The day had turned into a gorgeous afternoon, and I had a blast. A nice supper round the corner from this point, with this view of Mt. St. Elias over the Taan Fjord of Icy Bay is pretty hard to beat. As the light got nicer and nicer, I was puttering around trying to make some photos. It makes for a long day here in the Alaska summer – this one here was close to midnight. My last 3 shots of the day were this one, a vertical composition of the same scene, and then a landscape image of this area without the boat. Then I went to bed. During the night I’d glance out my tent door to gaze at the mountain – I was camped about 100 yards or so from here, on a nice little sandy patch of beach, with the door situated so I could open my eyes and get a full facial of Mt. St. Elias. I was hoping the weather wouldn’t change, and during the night, each time I checked, the sky was clearer than before – so I was pretty excited about getting some nice morning photos too. I opened my eyes around 3:30am, and the sky was a gray misty haze .. a fog had rolled in outta nowhere, and I couldn’t see the shoreline, never mind the mountain 15 miles away. So I was kinda bummed. I sank back to sleep, finding solace that I knew I’d at least be able to catch up on some sleep in the morning. I get up, around 6:30am, and it’s cloudy and gray, drizzling rain, and nothing much going on. I grabbed my camera, on the ‘just in case’ deal, and headed off down the beach. After about 30 minutes, I decided this wasn’t as good an idea as I thought, and returned to camp – the light was terrible, and I was sleepy. So about 7″30 I get back to my tent. Rather than head to the kitchen area to eat, I sank inside the tent, grabbed my book “The Wilderness Condition”, a compilation of essays put together by Max Oelschlaeger. It’s a great read, but some of it is a bit too ‘heavy’ for reading at 7:30 in the morning. So I drifted off a little – floating in that little zone between awake and not quite so awake. But you’ll have to wait until tomorrow to find out the next part – I’ll give you a hint though. Tomorrow’s photo will be another image of this same sea kayak – in a slightly different location, and shape. More photos of Sea Kayaks and sea kayaking. This entry was posted in Adventures, Alaska, Cool stories, Kayaking, Landscapes, Travel, Wrangell - St. Elias National Park on June 25, 2008 by Carl D.
Looks like a nice rig there on the shore man. Definitely sharper than my plastic p.o.s. I already know what happened, because I saw your later posts, but i’m not surprised. Seems like that’s the first thing they go for!! !I think they are intelligent to know that this is your way of getting around! !